This engagement ring includes two tones of precious metal. The palladium is the perfect color to place in the head to accentuate the G color in this diamond, and the yellow gold is perfect for anyone looking for a warm and comforting band. 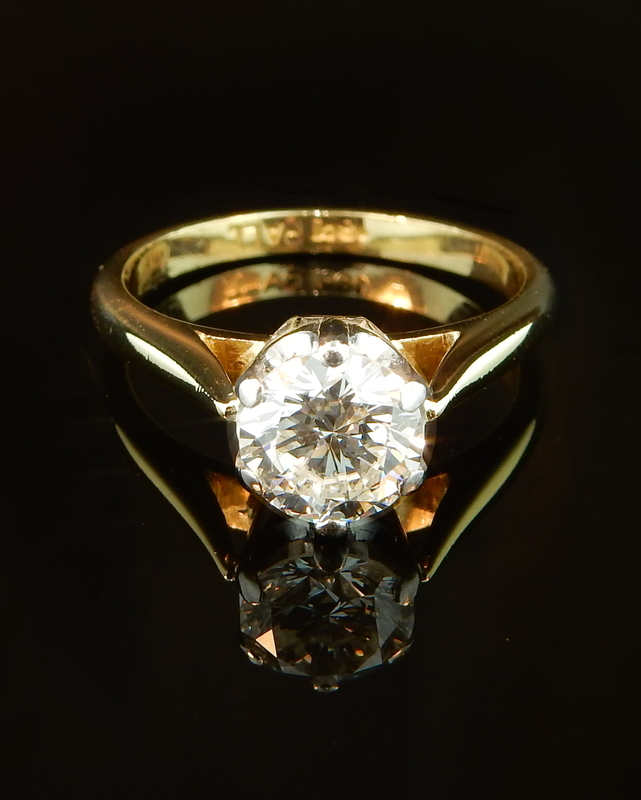 This simple solitaire is a very special estate piece. This piece is very unique! Featuring 0.55tcw diamonds, this simple yet elegant engagement ring is the perfect low profile setting. 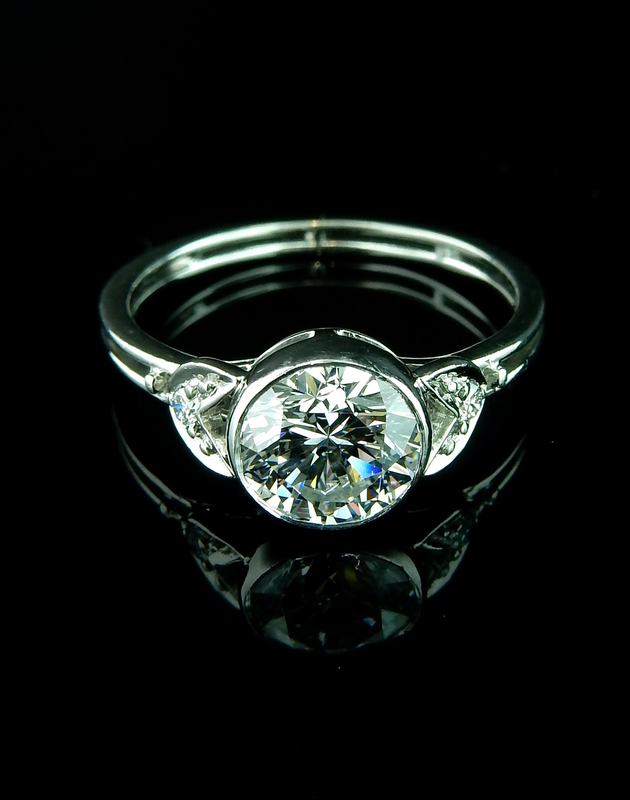 The milgrain on this ring adds added depth which helps bring this stunning ring together. Old mine cut diamonds represent a wonderful era of jewelry. 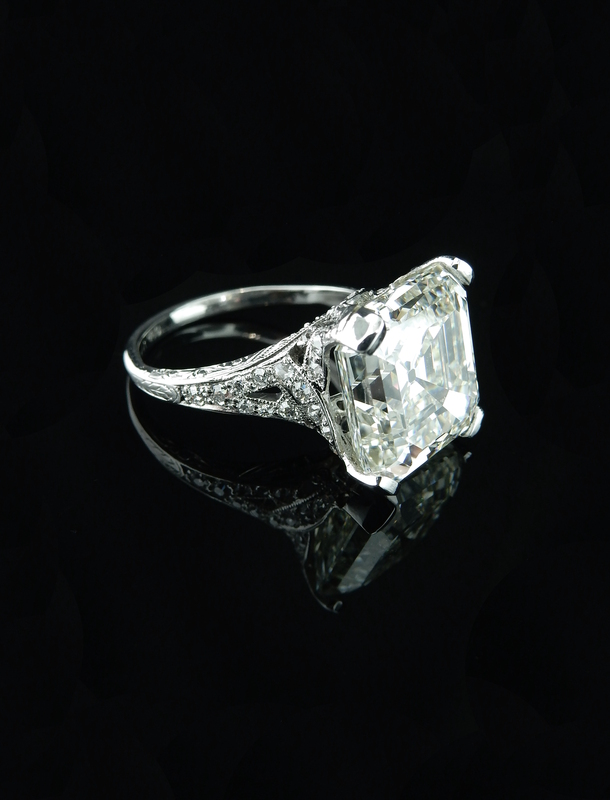 These diamonds exhibit an immense amount of personality that you sometimes aren't able to see in modern cuts. 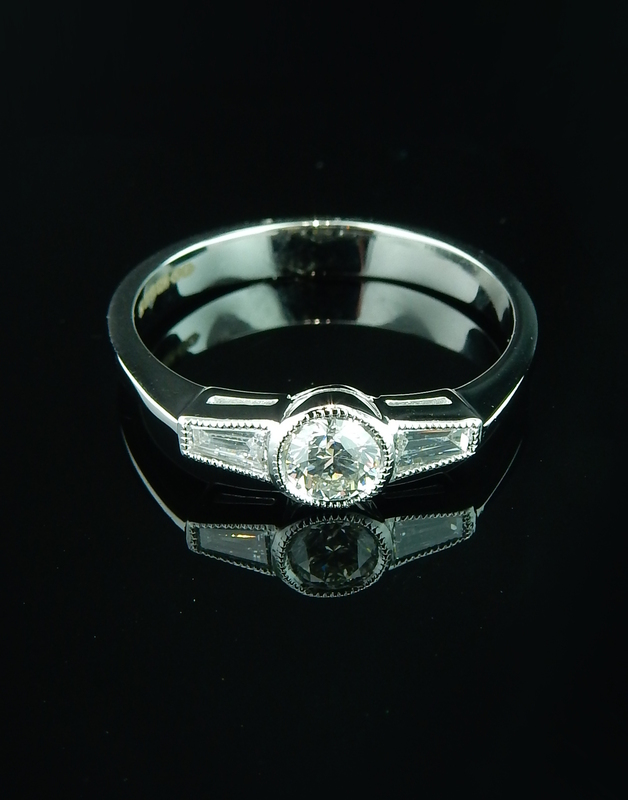 Give the gift of individuality with this old mine cut diamond engagement ring in platinum. Fancy colored diamonds are a fun way to add a little extra personality to your diamond engagement ring. If you're a colorful person, why not have a colorful diamond to match? 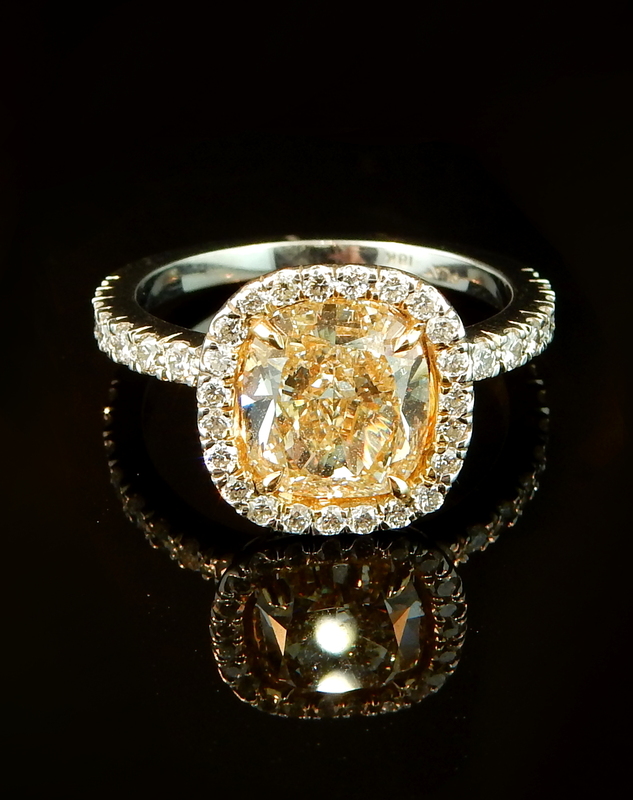 This fancy yellow diamonds ring adds a complexly new element to an otherwise traditional engagement ring. There are so many reasons that you need this ring. 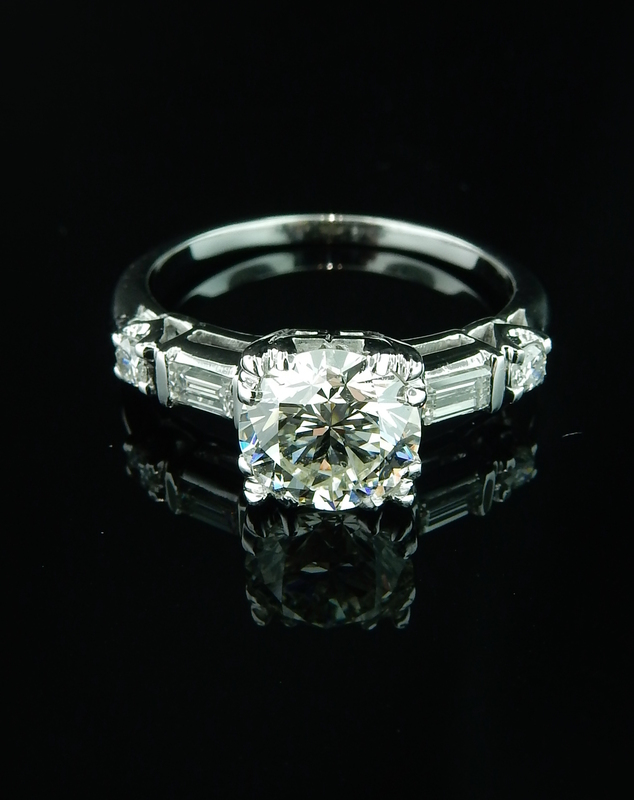 Starting with the 10.42ct GIA certified VS1 clarity center asscher cut diamond and ending with the vintage diamond and platinum mounting, this piece is one of a kind. 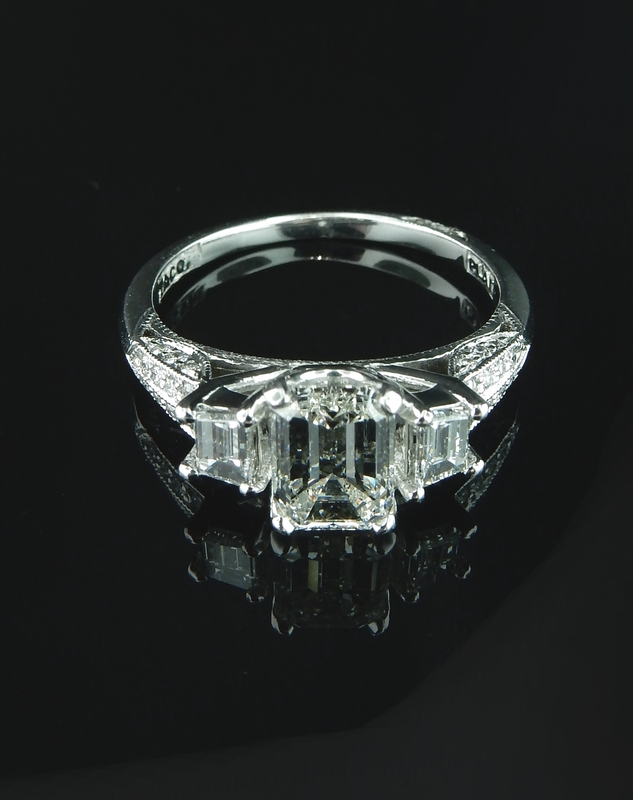 Feel like a queen with this treasured and extraordinary diamond ring. Illusion settings accent your center diamond so that the diamonds appear even larger than they are! This illusion setting is incredibly unique. 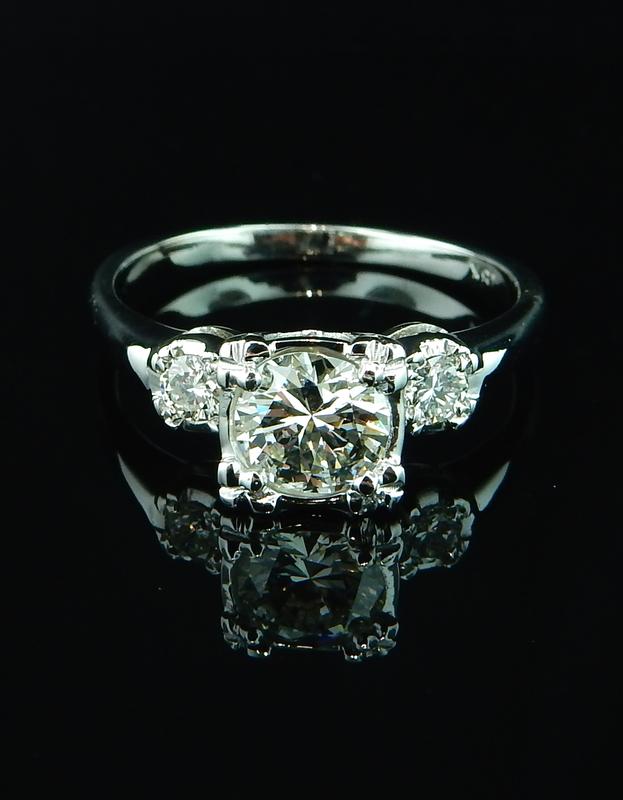 Featuring one center 0.65ct diamond with VS clarity, this ring is a real eye catcher. The accent diamonds add an extra burst of sparkle which makes this ring a perfect piece for your special day. This phenomenal and simple engagement ring features one center round brilliant diamond with two accent tapered baguettes. The total carat weight of this piece is 0.37tcw. The milgrain edging on this piece adds dimension to this classic design. What an incredible creation! 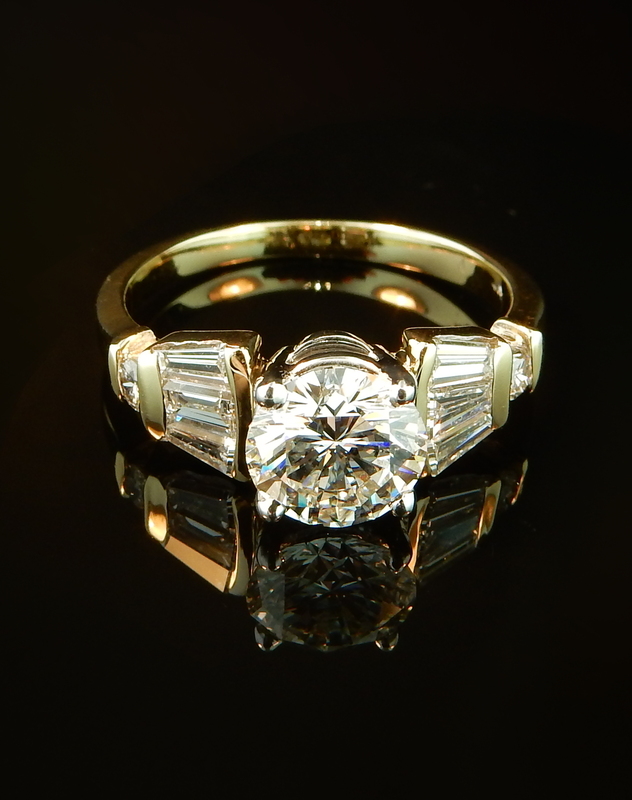 This 1.55tcw diamond engagement ring dates back to the 1950's and is exceptional quality. 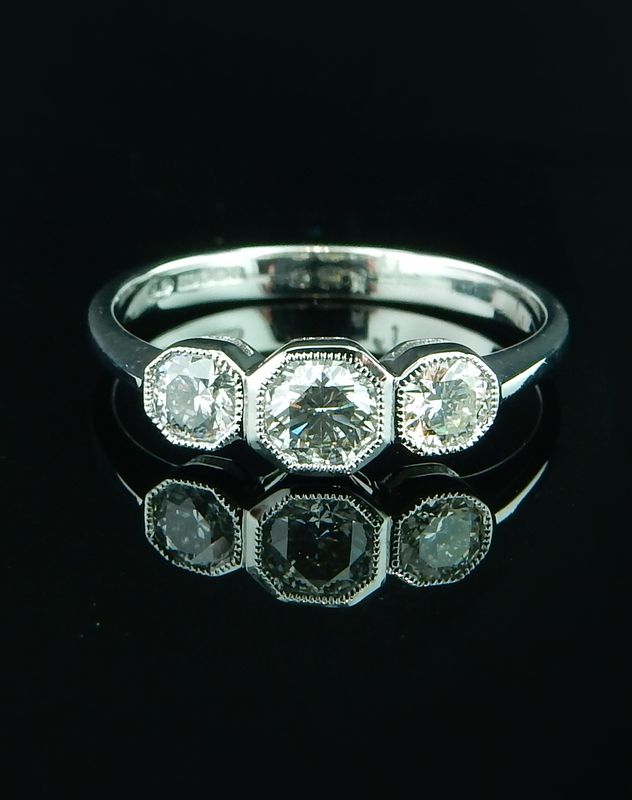 This ring includes two baguette cut diamonds along with two round accents. All set in platinum, this is a remarkable piece of jewelry. Yellow diamonds come in different tones and saturations. This beautiful and subtle yellow diamond is accompanied by two colorless diamonds that provide the perfect accent to the overall piece. 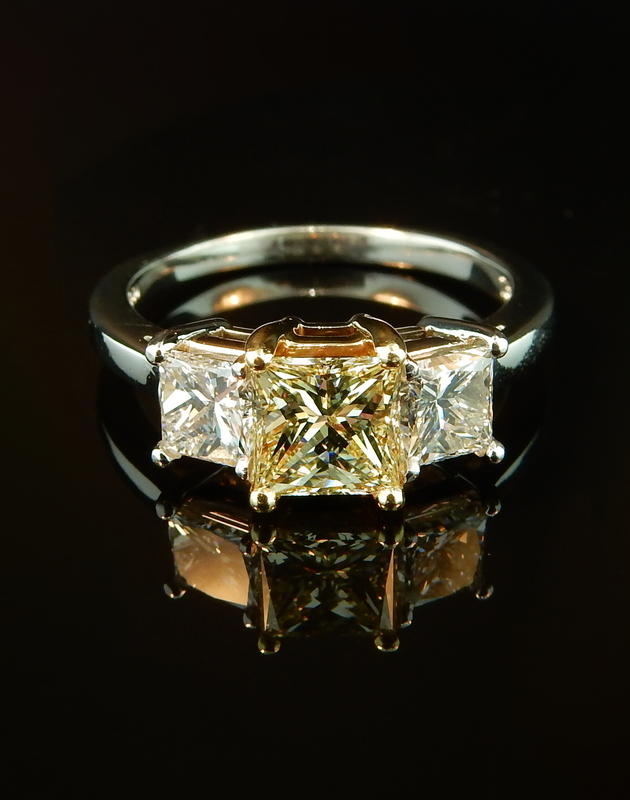 The stone in this engagement ring is exceptional. It is delicately tube set with an airline shank. The side leaf-like details incorporate a vintage feel to this slightly more modern design. This ring has so many magnificent elements. From the diamonds, to the design, to the precious metal, this ring has it all! Tacori crafted this ring which includes a center GIA certified 1.03ct diamond with an immense amount of accents that can really only be appreciated in person. 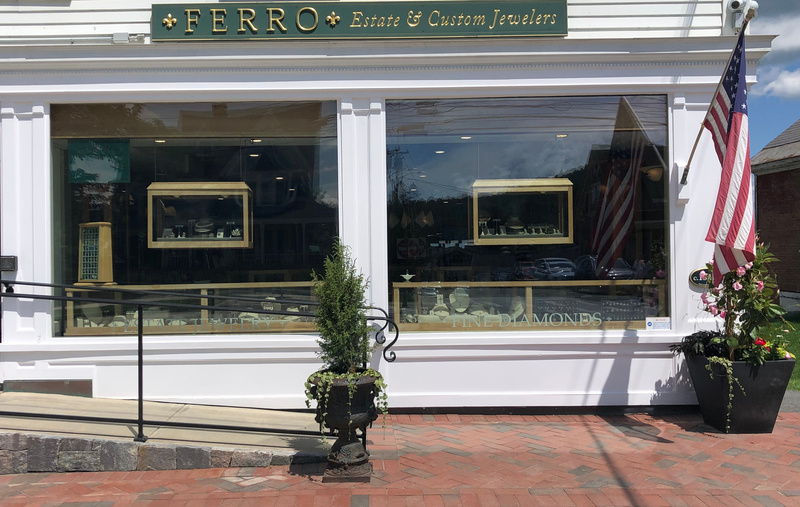 Come check out this incredible ring today. This ring speaks to all yellow gold lovers. 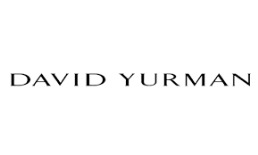 It incorporates a white gold head so that the colorless center diamond stays brilliant and white. This amazing center stone is accented by stunning tapered baguettes and two side channel set rounds. 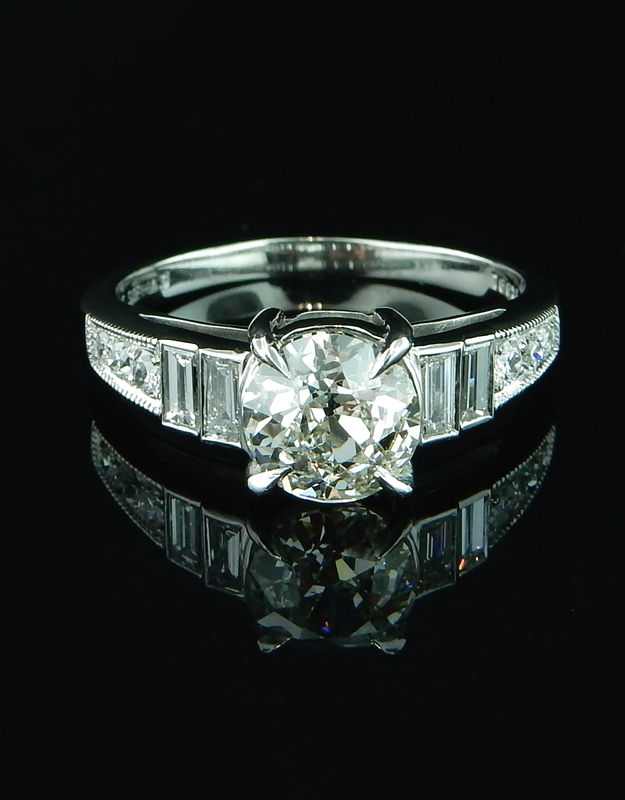 The variety of fancy cut diamonds in this piece gives it a pop of originality.